AM FM Portable Radio Designed for Long-Range Reception and Audio Clarity The purpose of the CCRadio-2E is to make weak signals strong and also to produce crisp, accurate audio for the spoken word. AM performance comes from our patented Twin-Coil Ferrite® AM Antenna and traditional FM reception is exceptional in its ability to bring in a weak station clearly. Audio can be adjusted for accurate and warm voice rendition and good musical performance. This radio also has the weather band and alert along with the 2-meter Ham band. More information about the 2-Meter Ham Band can be found at CCRadio.com/2-meter. Since the CCRadio’s original debut the external design has remained the same but there have been countless revisions inside to improve performance, durability and audio. 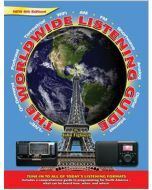 It is one of the most popular portables manufactured and many experts feel it is the best AM radio made. It has evolved into C. Crane’s flagship radio. Aux in Jack: 1/8" (3.5 mm) stereo, 300 - 1000mV RMS (line level) input from external audio source. Do not overload.